ENA Navratri 2016 Garba Mahotsav celebration for 10 days with famous celebrities. You can meet your favorite Bollywood and Tellywood Stars at Ena Village. ENA Navratri 2016 will starts from 1 October and ends on 10 October, 2016. The ENA Navratri 2016 Venue is Ena Village Surat. Since last 25 years Ena Kelavani Samiti and Ena Yuvak Mandal organize ENA Navratri Mahotsav at Ena Village, Surat Gujarat. ENA Navratri Garba Mahotsav is hosted by ‘Ena Gaam Parivar’. Lets rock the Navratri with your friends and family. The most important and famous think about Ena Village is Navratri festival celebrtaion with different celebrities every year. ENA is a village located in Surat District, (Tahsil Palsana), near Bardoli. DJ RINK to rock the 10 days of ENA Navratri 2016 and Bollywood Celebrities to come in Ena Gaam Navratri. Venue: Ena Village, Near Bardoli, Surat. The Gujarat's Biggest Festival Navratri 2016 at Ena Village Surat. 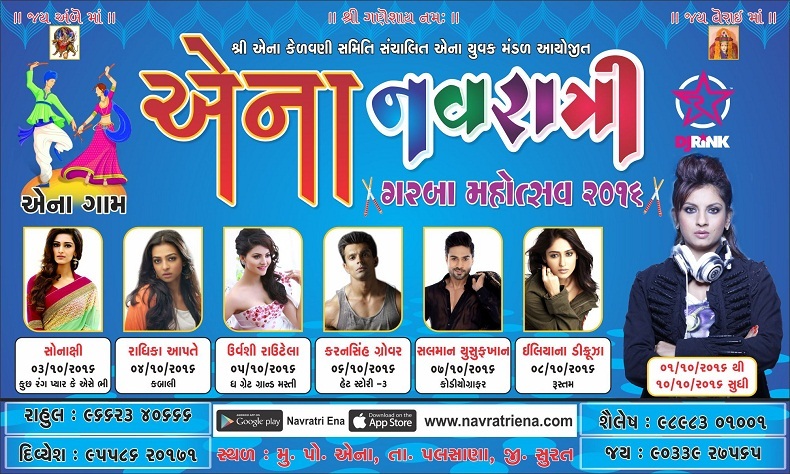 Dandiya lovers get ready to play Navratri Garba Raas will Actor and Actress at Ena Surat. Watch Live Telecast of Ena Garba Mahotsav 2016 at its official site of all days. Make memorable Navratri 2016 by playing dandiya with celebrities. Sony TV Serial Kuch Rang Pyar Ke Aise Bhi lead actress Erica Fernandes aka Dr. Sonakshi Bose. She done Movies in Hindi, Tamil, Telugu and Kannada Languages. Sonakshi at Ena Navratri 2016. Erica Fernandes Sonakshi popular serial actress in ENA Navratri 2016 Surat. Radhika Apte Bollywood Actress at ENA Navratri 2016 Surat. Radhika Apte recent movie was Kabali with co star Rajinikanth. Radhika Apte has done Movies in Hindi, Tamil, Bengali, Marathi, Telugu, Malayalam and English and won many awards also. Radhika Apte to come in 2016 ENA Navratri. Urvashi Rautela Great Grand Masti Actress to be present in ENA Navratri Mahotsav 2016. Urvashi Rautela latest song is Gal Ban Gayi. Love Dose Actress Urvashi Rautela in Surat at ENA Navratri 2016. Miss Universe Urvashi Rautela in Surat Navratri. Karan Grover is an Indian actor and model. Karan Singh Grover has done TV Shows and Movies. Karan Singh Grover married famous Bollywood Actress Bipasha Basu. Karan Singh Grover Hate Story 3 Actor at ENA Navratri 2016. Salman Yusuff Khan is an Indian dancer and Actor. Dance India Dance Season 1 Winner Salman Khan at ENA Navratri Mahotsav 2016. Recently coming in Jhalak Dikhhla Jaa Season 9 Salman Yusuff Khan as contestants. Ileana D'cruz Rustom Actress in ENA Navratri Surat. She has done many movies in Hindi, Tamil, Telugu and Kannada. Upcoming Movie of Ileana D'cruz Baadshaho with co stars Ajay Devgn, Emraan Hashmi and Esha Gupta. Ileana D'cruz at ENA Navratri. Khelaiya get ready to play garba with celebrities this Navratri at ENA Navratri Garba Mahotsav 2016. Make this Navratri special and book your passes for ENA Navratri 2016 Surat.